I am keeping this initial post short, and… ahem, (throat cleared) flippin sweet. (I promise I will not do that EVER again). So, lots of changes are happening at the restaurant, and I am going to go into detail here. But not tonight. 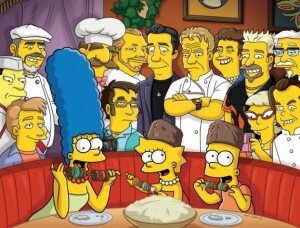 No, tonight, the Simpsons aired a foodie episode. I love the Simpons, unabashedly, I have the first 10-12 seasons on DVD, it was one of the proudest moments of my life to hear my son say “Poppa, can I watch Homer Simpsons” – but the show, while still swinging is a shadow of its former self, we all know this. I mean Conan O’Brien used to write for the show in its heyday. Seriously – how do you top the funny that comes from that guys mouth. So, I was excited to see this was a foodie episode, Gordon Ramsey swearing at Marge, Anthony Bourdain doing his bad boy impersonation of his former self and more. I only hoped it would be decent, and not embarrassing for itself – and I was not disappointed. By no means is this anywhere near the stature of the best Simpsons. Episode. Ever… “Bart Sells his Soul” (watch it, seriously, if you do not have milk shooting out your nose, you are dead. Go to the morgue and find your toe tag.) But it did not fall flat on its face, there was some cleverness to it. Though it was sad they did not procure Chef Marcel Vigneron for the final tasting scene (deconstruction, test tubes etc…) – instead the always awesome Hank Azaria did his snooty foreign slightly fey thing, and was sadly, less than awesome. But still – all ways salvaged for the meth dealer childhood flashback moment with deconstructed apple pie. Deconstruction is quite the “thing” in cooking. I don’t quite follow, isn’t a taco a taco whether they chef puts it together in the kitchen or you do on your plate. Anyway. Simpsons. A for effort, solid B- for execution. That’s what is in the Chef’s warped mind tonight.